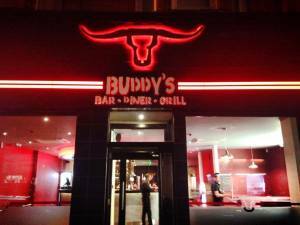 It’s been a long time in the pipe line but Buddy’s Bar Diner Grill opened last night on Pollokshaws Road. The Skirving Street takeaway, now just over a year old, was a finalist in the Takeaway category of the Scottish Restaurant Awards earlier this year and then, in October, it won the hard fought Glasgow’s Best Burger competition. The new sit-in venture has been keenly anticipated for months. The 5pm Dining blog will have a full post on the new Buddy’s tomorrow.